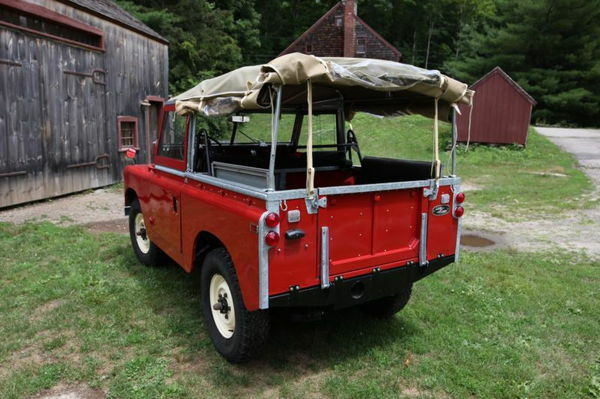 Here is a 1959 Land Rover Series II that has undergone a frame off restoration. The goal of the restoration was to return the rover to its original factory appearance but with a few minor upgrades to its mechanical systems. New soft top and hoop set. Original deluxe seats from a late series iia. New 4x4 lever knobs, new starter button. All exterior steel pieces have been regalvanized. Original lucas tail lights and turn signals, say ''made in england'' on the lenses. Many brackets underneath are galvanized for corrosion resistance.